Living transplants in mainland China differ from those in the rest of the world. In China, it is common practice to excise whole vital organs from living sources. A single kidney can be removed while still preserving the quality of the donor’s life, but extracting both kidneys, a heart, or a liver kills the donor. Chinese hospitals and transplant centres often write about their capabilities in various forums – that’s why this Update is possible ­- yet the crucial medical distinction of whether the donor will live or die rarely appears in the literature. Instead Chinese transplant hospitals simply claim to have adequate supplies of young and healthy organ donors. Little distinction is made between extracting a single kidney (not necessarily lethal) and extracting a whole vital organ such as a liver. Organs are transplantable only when the time and location of a donor’s death are known in advance and the organ procurement team is well prepared. Thus, vital organs from those who have died outside of a hospital (e.g. in car accidents or other trauma), would involve intolerable warm ischemia times and are not viable for transplant. In China, medical personnel usually go to the execution grounds to retrieve organs from prisoners right after execution. Brain-dead organ donors have become the main source of transplant organs outside of China for decades, as such organs could have the shortest warm ischemia time possible. Because Chinese tradition requires bodies to be preserved intact after death, China has neither brain death legislation nor significant voluntary organ donation. Donations after cardiac death (DCD) were another commonly listed organ source in China’s transplant centers. Warm ischemia times of 0 to 5 minutes with “no-heartbeat cadavers” have become a standard practice of Chinese transplant doctors. According to Chen Zhonghua, between 2003 and August 2009, only 130 citizens successfully donated their organs after death in mainland China.1908 The liver sources used by the Tianjin Organ Transplant Center alone have exceeded the number of citizen organ donations in all of China. 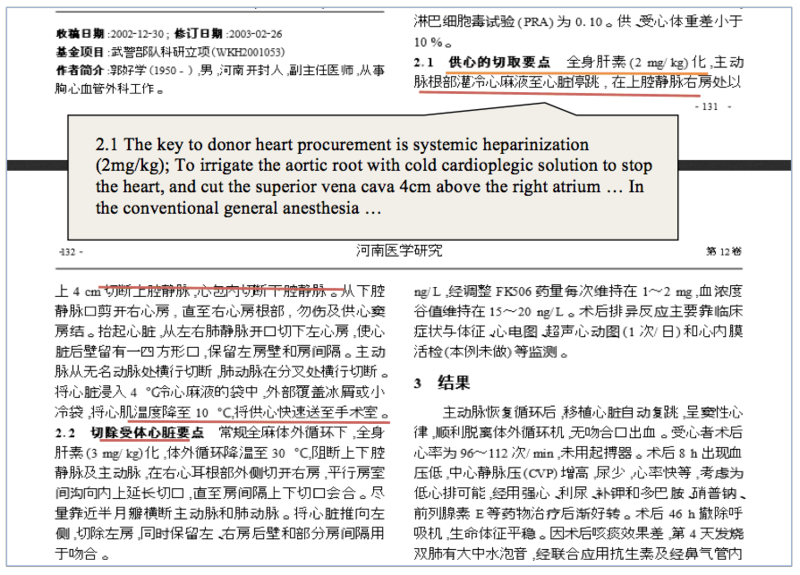 Here are two examples on how the China’s transplant doctors excise organs with a short warm ischemia time. The donor’s heart was stopped with the irrigation of cardioplegic solution after opening the chest. This is corroborated by the 3-minute warm ischemia time. The 85-minute cold ischemia time indicates that the donor organ procurement and transplant into the recipient took place at the same location. After being declared a “brain-dead patient,” the donor was intubated. During intubation, “secretions of the nose and mouth were quickly cleared away, to prevent the regurgitated material from being inhaled.” This implies that the donor was breathing spontaneously at the time. The discharge of residual blood from the heart was accomplished by its automatic beating; the heart “emptied after several cardiac cycles.” This indicates that the donor’s heart was beating automatically at the time. The warm ischemia time for the heart and lung(s) were 5 minutes, and the cold ischemia time was 100 minutes, indicating that the organ donor and the recipient were located in the same place. One thing that should be pointed out here is the order in which the donor was declared brain-dead and intubated. Clearly, the purpose of intubation was not to resuscitate the donor but rather for the purpose of excising organs from a living body. In the end, the authors claimed that they had conducted 38 procurements in the same methods. That implies at least 38 living organ “sources” had been killed this way in Xijing Hospital this way by 2008. The clinical requirements for declaring brain death requires three conditions, all of which must be present: deep coma, lack of brainstem reflexes, and lack of automatic breathing. Directly “diagnosing” brain death without intubation and resuscitation violates medical ethics. The attribution of so many organs to young adults after sudden deaths raises questions. What caused the deaths? 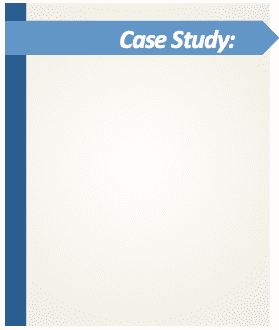 How was news of the deaths communicated to various hospitals in such a short time? What unknown procedure enabled the hospitals to harvest “fresh” organs so soon after the deaths? Or does the phrase “young adults after sudden deaths” refer to executions as well? According to a regulation issued by the Chinese Ministry of Health,1925 once a kidney is removed from a body, it must be transplanted within 24 hours. The time limit for livers and hearts are 15 hours and 6 hours, respectively. Ideally, the donor organ should be transplanted immediately after the donor’s death, or directly taken from a living donor. Emergency liver transplants are surprisingly common as this report from the Dalian Evening News recounts:1926 On July 12, 2003, a 50-year-old Taiwanese named Liu Dongquan was admitted to the Organ Transplant Center of the Second Hospital of Dalian Medical University. The next day, the patient fell into a coma and needed an immediate liver transplant. Two days later (on the 15th), a matched liver was found in Tangshan, Hebei Province. On July 18 at 4:50 pm, the liver was transported to Dalian. At 5:30 p.m., Liu was moved to an operating room. Five hours later, the liver was successfully transplanted into Liu’s body. A liver’s cold ischemia time should not exceed 15 hours. For a transplant which occurred on July 18, the liver found on July 15 must have been in the body of a living person at the time; otherwise, the liver would have become unusable by the time it was transported to Dalian on July 18. 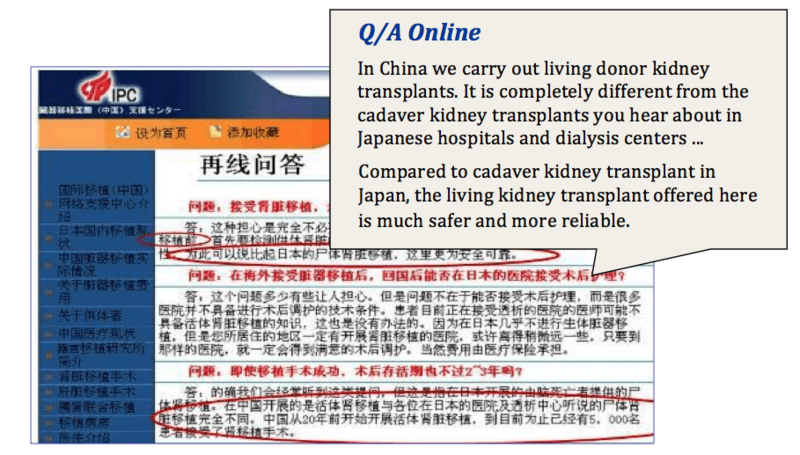 In September 2004, Sanlian Life Weekly contained an article titled “Tianjin Survey: ‘Asia’s Number One’ in Organ Transplantation,”1932 in which the head medical resident at Tianjin Oriental Organ Transplant Center, Zhang Yamin, said that donor organ procurement is costly, that a single organ perfusion preservation solution is not a small expenditure, and that every major organ requires four bags of preservation solution at 5,000 RMB each. At the beginning, there were no domestic manufacturers of perfusion solutions, so they had to use preservation solutions brought back from Japan, bag by bag, by Shen Zhongyang. Wang Lijun’s drug experimentation with living subjects included improving medication for lethal injections to reduce complications from rejection responses after organ extraction and transplantation, as well as improving organ preservation solutions. The reporter described the experts gathered at the execution site as if they were staff of a research laboratory. The reporter referred to Wang Lijun as director of the Psychological Research Center. The reporter also listed professor and doctoral advisor Xi Huanjiu, the dean of Jinzhou Medical College, and other experts in medicine, criminal investigation, and psychology. They were described as conducting psychological analyses and clinical research on reportedly violent criminals who received the lethal injections. Wang Lijun also presided over a major project on atraumatic dissection in the Asia-Pacific region.1935 The Swiss Virtual Dissection Foundation, the Tribunal Science Institute of University of Bern in Switzerland, Medical University of Graz in Austria, China Medical University, Jinzhou Medical College, and the People’s Liberation Army No. 205 hospital all took part in this project. Between 2003 and 2008, Wang Lijun carried out thousands of what were effectively live human experiments. This raises questions both as to how Jinzhou, a third-tier city with a population of less than 900,000, had thousands of executed prisoners available for these experiments, and whether the prisoners were actually conventional death-row convicts. Wang Lijun was transferred to Chongqing City in June 2008, and served as deputy mayor and the police commissioner of Chongqing City. During this period, he established the On-Site Psychology Research Center in Southwest University, and acted as its director, professor, and doctoral advisor. He continuously intensified the study on atraumatic dissection. The paper referred to a software simulation in which this process would be explored, to provide data for real-world scenarios. The paper also set out an experiment, stating that until October 2007, twelve corpse heads were used for the impact tests. All of the subjects for the experiments were male, age 26-38, with an average age of 31. However, the overall purpose of the study seems contrary to its claim of saving lives. Instead, it studies injuries to the brain at different levels, (following injuries resulting from violent impacts to the primary brain stem, victims are left with various levels of cognitive and sensory motor dysfunctions, which can lead to respiratory and circulatory malfunctions that can be life-threatening1938) which could be used to determine how best to kill; an impact to the temple that is placed just right can cause brain stem injury, loss of consciousness, and even brain death. The heart is still beating, and various organs and tissues continue to live. This impact is an effective alternative to lethal injection while maintaining organ function and reducing rejection responses. 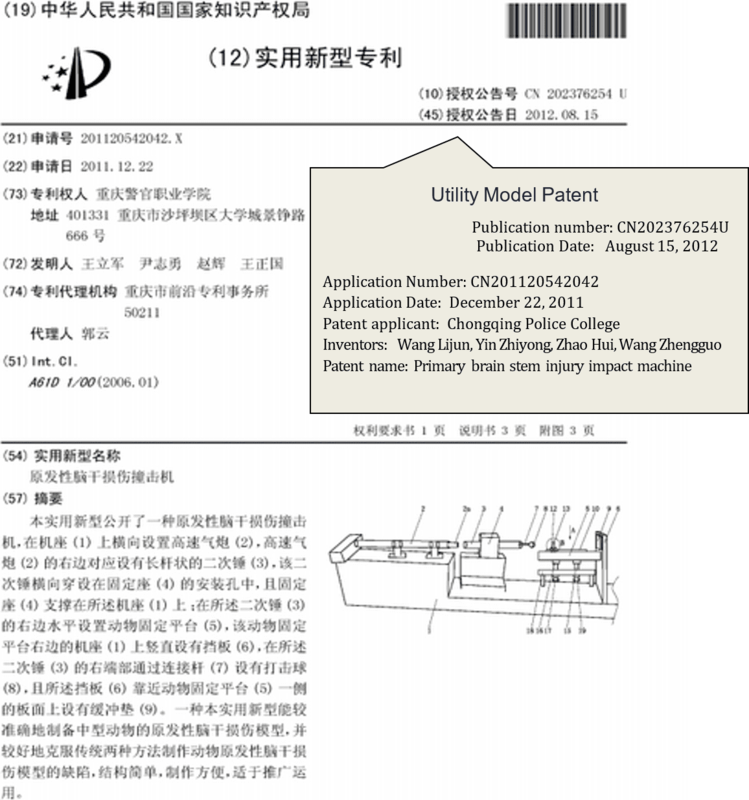 In the China Patent Search System, we can find the “primary brain stem injury impact apparatus” 1939 under patent number 201120542042X (pictured below); the inventors are Wang Lijun and the same authors of the paper who conducted the impact experiment on the 12 heads. The instructions also claim that the device has a “simple structure, is easy to produce, and adapted to promote the application.” The protection of utility model patents is ten years from the filing date in China. It is odd that this patent application was submitted on December 11, 2011 and published in August 2012, but its current legal status shows that the patent was terminated in February 2016. On November 19, 2005, “Bodies: The Exhibition” opened in Manhattan, New York City, sponsored by Premier Exhibitions. On display were 22 skinless corpses and 260 real human organ specimens that had tissue fluid extracted and silicone pumped into them. One piece of the exhibit features a young mother and her unborn baby. According to Chinese law, pregnant women cannot be sentenced to capital punishment. Who would donate the remains of his unfortunate wife and unborn child to a paid exhibition? Where did these human specimens come from? How did they become exhibits? 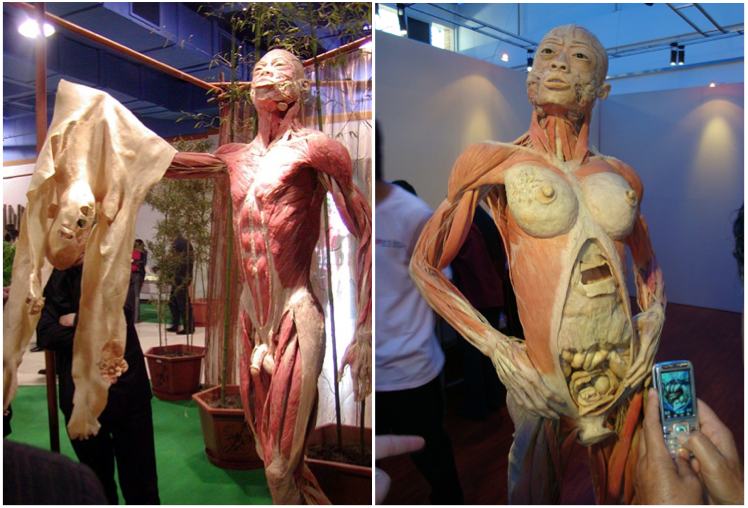 In June 2002, Sui Hongjin (deputy director of the Anatomy Department at Dalian Medical University), with another partner, opened a company named “Dalian Medical University Biology Plastination Ltd.” In 2004, Sui registered another company named “Dalian Hongfeng Biology Ltd.” Its main business is human body specimen manufacturing and exhibition. Sui Hongjin could receive fresh corpses from a variety of local sources. The drive from Wang Lijun’s transplant operation in Jinzhou City to Dalian is about four hours. Wang Lijun was, as noted, a protégé and right hand man to Bo Xilai. Bo was the mayor of Dalian from 1993 to 2000, In 2000 and 2001, Deputy Secretary of the Liaoning Province Party Committee, then Acting Governor of Liaoning Province, then Governor in 2002. During this time, he invested one billion RMB to carry out prison expansion and reconstruction throughout the province, and to build new large-scale prison facilities.1943 In the vicinity of Sui Hongjin’s corpse factories, there are Liaoning Province No. 3 Prison, Dalian Nanguanling Prison, Dalian Labour Camp, and Yaojia Detention Center. On November 27, 2003, a cover article named “Corpse Factory Investigation” published in the second issue of Orient Outlook1944 reported that, in addition to the companies operated by von Hagens and Sui Hongjin in Dalian, there were plastination specimen plants in Guangzhou, Shanghai, Nanjing, Qingdao, Shenzhen, Tai’an and elsewhere, and that China had become the world’s largest exporter of human specimens. On August 23, 2012, Southern Metropolis Daily reported that mainland China has several dozen manufacturers engaged in human plastination. Tender Date: December 1, 2006, to December 13, 2006 scaling. Transaction Supplier: Dalian Medical University Biology Plastination Co.
Procurement agency name: Miss Shan in Guangzhou Alliance & Procurement Tender Agency Ltd. 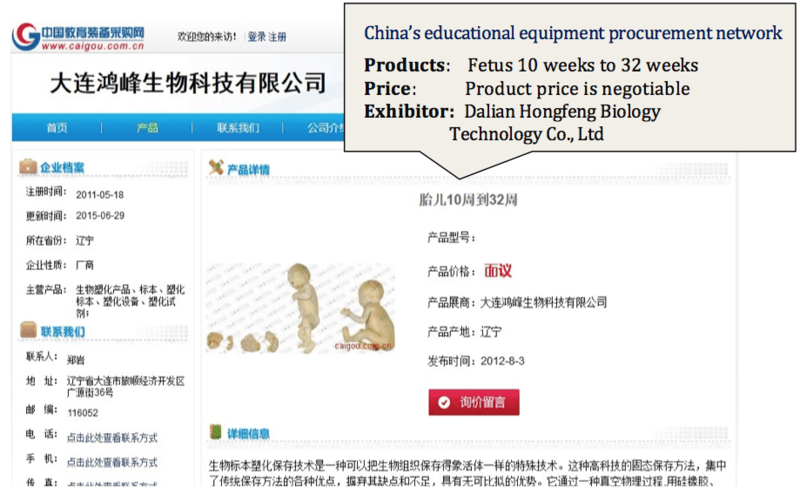 The successful supplier list: Dalian Hongfeng Biology Technology Co., Ltd.
For the nine years, between 2004 and 2013, Sui Hongjin’s several exhibits toured more than 60 cities in more than 20 countries. The number of visitors topped 35 million.1952 In 2005, “Bodies—The Exhibition” in the U.S. had become the main source of earnings for Sui’s partner, Premier Exhibitions. Below is the translation of a transcript of a call made to Sui Hongjin by an investigator from the World Organization to Investigate the Persecution of Falun Gong.1959 The investigator assumed the identity of a Party investigator and asked Sui about his business operations, including the provenance of the corpses. The call was made in late 2012, a period of great political uncertainty in China, not long after the purge of Bo Xilai. Investigations were being launched into many of Bo’s former colleagues, as well as his wife, Gu Kailai. These conditions would have helped to give Sui Hongjin the impression that he was speaking to a Party disciplinary investigator. Investigator: What channels served as your main source of bodies? Sui Hongjin: Dozens of corpses came from Public Security. They were procured by the Public Security Bureau. Investigator: Then they are from the police. How many cadavers have you received thus far? Sui Hongjin: I can’t remember now, perhaps dozens…if you come in person to investigate, I will discuss the matter with you. It’s not convenient to talk on the phone. Investigator: Which Public Security Bureau supplied you? Sui Hongjin: Dalian, the Dalian Public Security Bureau. Investigator: So the source of the dead bodies you used was from the Public Security Bureau. Do you know where they got them? Sui Hongjin: They … how do I put it, this was in 2004, there was once an internal report, a report to the Ministry of Public Security … because for some specific subjects, I only ask for a result. I cannot ask for too much detail … because I know this is a sensitive matter. I’m willing to cooperate with your investigation … if necessary, I can be interviewed, if you need a signed statement, that is not a problem. I stand by what I say.